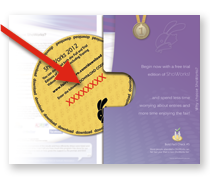 A Download Code can be found on the round, cardboard insert of the ShoWorks brochure booklet, or issued to you via email or phone by the ShoWorks staff. A Service Plan Number is a number given to registered users of ShoWorks, which allows access to various benefits such as downloading software, requesting expedited technical support, discounts, etc. This number may be found on your invoice upon purchasing or renewing ShoWorks or within the software under the Help>>About ShoWorks menu. A Serial Number is a number given to registered users of ShoWorks, which unlocks the Trial Edition into the full version of ShoWorks. This number may be found on your invoice upon purchasing ShoWorks or within the software under the Help>>About ShoWorks menu. A Download Code What's a download code?..or.. A current Service Plan Number What's a service plan number?..or.. A Serial Number What's a serial number?